Selecting multiple individual tabs can be done by holding Ctrl (⌘ on macOS) and clicking on the tabs, or you can select a range of tabs, from left to right, by holding Shift and clicking on a tab. Incidentally, this used to work from Windows 95 through Windows XP. Since Vista the Ctrl + click mechanism has been broken in the Windows taskbar. Back when I didn't know any better, I used Cascade to get all the open windows visible at once to select the next window. This was useful when there were already very many windows open so that I had lost track of them. Edit: Concerning selecting browser tabs, I like the way you can select them arbitrarily in Vivaldi and then tile or cascade or do other such operations with the selection - with Ctrl+click of course. I'm not quite sure what you mean by didn't know any better but it can definitely be useful to read the full window title. Everybody does. Opera's failure in this regard is that it only worked properly in the windows panel. I mean when I had not discovered Alt+Tab yet. The only upside of Cascade compared to Alt+Tab on Windows is longer window titles. Talking about old Opera or the new? In old Opera, another thing I like is the ability to get the list of open tabs (and more) by right-clicking the tray icon and select the one to go. Works like the best window list thingies on window managers in Linux. As far as I know, Vivaldi does not have a tray icon. Does the current Chropera? New Opera has no windows panel afaik. Vivaldi's had it for a while I believe, although I'm not sure how functional it was. It looks like it rivals Opera/Presto right now in any case. Just in time for the GDPR nonsense taking full force, Opera's VPN stopped working. For me, it doesn't connect at all. Earlier, there used to be options to pick a country on whichever continent you wanted, these options are gone now. Looks like I must finally sign up to a paid VPN service. Just in time for the GDPR nonsense taking full force, Opera's VPN stopped working. 1- Opera's VPN keeps on working for Windows version. Why it doesn't anymore for Linux you have to ask Opera. 2- GDPR is not "nonsense". Maybe you prefer the American's Big Brother way of "freedom", I don't. There's no alternatives. I didn't even know there was a Linux or Windows version. I only used the Android version. These days I use a paid service because I need a solid connection to Finland. The alternative, when one does not know how things work, is to refrain from messing them up further. I have been rather clear what I mean by nonsense, namely it makes internet clunkier to use and it does not provide a single benefit. EU big brother is no better from American big brother. EU big brother is no better from American big brother. Maybe... but it has a different perfume. I have been rather clear what I mean by nonsense, namely it makes internet clunkier to use and it does not provide a single benefit. RGPD starts with changing processes that applies to everyone as citizens. For example, I agree entirely that everybody has the right to not allow public or private services to make copies of people's ID card. Or, that anyone has the right to know what data exactly services have about them and demand it's immediate correction or removal. These are very very important measures for people's empowerment. As specifically for the Internet you probably have a more in depth knowledge than I have, I simply believe that there's nothing to stop "them" knowing (and storing for future eventual usage against you) everything people do. The importance of EU's RGPD is like the importance of EU not allowing the commerce of cloned animals for the food industry (unlike the US, Russia and China). At least we can't be accused of doing nothing. What you are doing with Qwant is your business and yours only. To protect your privacy, Qwant makes every effort to ensure the security and confidentiality of its users personal data. We collect as little data as possible. Therefore, we forbid ourselves to use any cookie or any other tracking device that may help build your profile for advertising purposes. Moreover, your queries are anonymized by dissociating them and the IP address you used, in accordance with recommendations by the French data protection office, CNIL. Things are different in the EU. For better. You probably think "they may be bastards, but they are our bastards" whereas I think "even if our bastards, they are still bastards." RGPD starts with changing processes that applies to everyone as citizens. For example, I agree entirely that everybody has the right to not allow public or private services to make copies of people's ID card. It does not work this way. The way it works is that you are pushed for consent. And regardless if you give consent or not, the authorities/companies can make copies for their own purposes. Nothing has changed with regard to earlier regulations except that people are being bugged for consent. As to the Qwant statement, it's Qwant's own initiative, not required by the GDPR or any other EU regulation. If it were required, Google would surely have a similar statement. [Opera ASA] announced the browser, which comes with a built-in cryptocurrency wallet, is now available for Android. This makes Opera the first mainstream browser that comes with cryptocurrency and blockchain features. "Our hope is that this step will accelerate the transition of cryptocurrencies from speculation and investment to being used for actual payments and transactions in our users' daily lives," Opera executive VP Krystian Kolondra said. Does anybody have any idea what the idea is? I never used it, but I am under the impression that blockchain is like a protocol and cryptocurrency is like an application of it, roughly the same relationship as internet and a website are to each other. So what's the idea of including a blockchain "wallet" in a webbrowser? To help you get started with mining some cryptocurrency? Ah, I get it. It's to help cryptominers get easier access to your computer so as to mine from you. Thanks! On Android, it is far more important to have a reading mode in a webbrowser. I don't see it in the current version of Opera anymore. Where did it go? Or if not a reading mode, then at least some presets to change colours and font sizes. At best to provide full options to set user-preferred font faces and all colours. 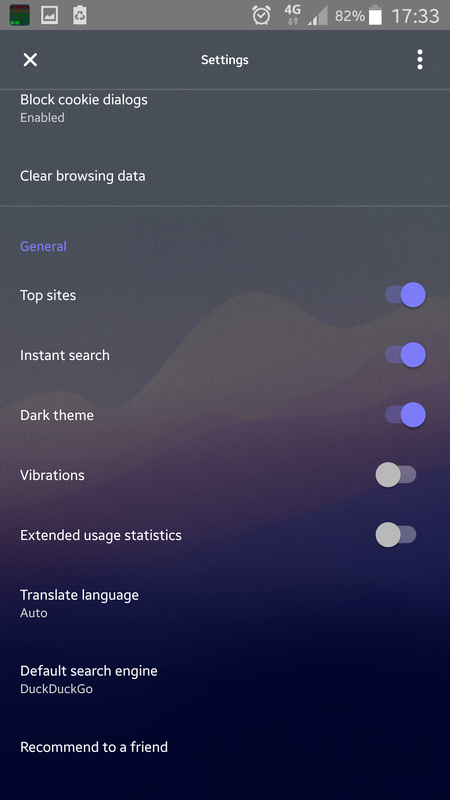 Opera for Android currently only has some incomplete night mode. The only interesting option in current Android Opera is offline webpages, but that was there since day one in old handheld Opera. I guess the new developers have simply forgotten to remove it. The additions in current Android Opera tend to mostly add confusion. For example, what is the difference of adding to Bookmarks, to Home Screen, and to Speed Dial? Is there any distinct access to them all? None that I can see. Bookmarks and Offline webpages would be quite enough. now you use on YT? I don't use Opera Presto much these days, let alone for YouTube. I had pretty much given up on Opera, even on Android. I just don't understand the thing anymore. It used to be lightweight and render webpages so that they were legible, but this ceased to be the case a long time ago. Most lately, their reading mode has become so dysfunctional that I saw no purpose to the whole browser, compared to the reading modes that Edge and Samsung Internet are providing. The only point that Opera for Android still had was the ability to save pages offline. Now I began trying Opera Touch, with low expectations. However, the first launch walkthrough is pretty sensible. - Do I want ad blocking? Yes, if it works. - Do I want to allow everybody to mine crypto from me? No idea why this is even an option. Do I even have crypto? Will it save the world if I allow it? Should browsers permit such evident intrusion into user-space? 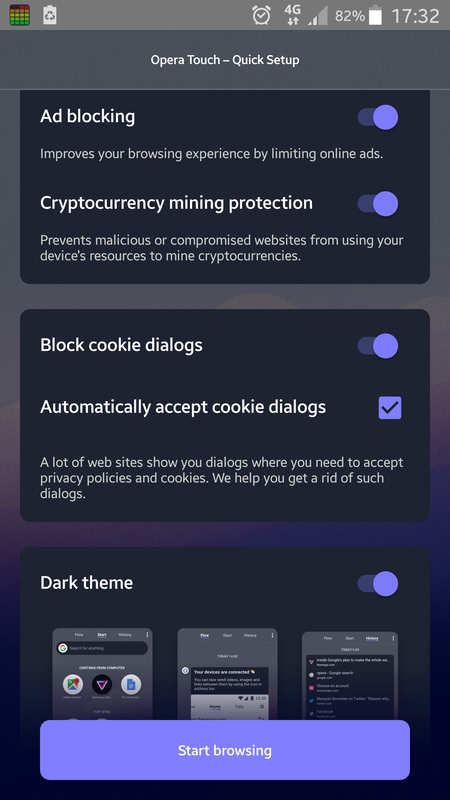 - Block cookie dialogs? Yep, I passionately hate those, so let's try. - Dark theme? Nice touch! Next I go into Settings. - Extended usage statistics? Meaning when I turn it off, you will send only limited usage statistics? Who are you kidding, Opera! - Translate language? Where's the "never" option?! Okay, let's try the most popular website in my homeland. And immediately I am faced with an ad and a cookie popup. Apparently the cookie popup block (which should be as standard a feature in modern browsers as popup blocking used to be) only works if the popup is in English. Bummerz. Already calling for an uninstall. The only bookmarking option is Add to homescreen. No offline pages. No reading mode whatsoever, not even in some broken intermittent form. No navigation with the volume keys. Ah, and it silently set itself as system default. All in all, not much there to keep me, and sufficiently much there to repulse. More Opera Touch rant. The big fat button thingie that shows up at app launch and when you are at the top of a webpage or when scrolling up, I would maybe tolerate it if it were configurable. Including hideable. As it is, it just gets in my way. Soon it will be in my way for the last time. Whereas I still prefer the likes of Xfce Whisker menu or Rofi or even Windows menu since XP with this common idea: Hit the hotkey/combo and start typing to find any program. Maybe I am just old and conservative. You mean Quick Launch like on Windows? Indeed I don't these days. On desktop I don't do it at all, because there is no such thing in i3wm. And whatever you may end up putting there (provided that the taskbar of your desktop has a location for quick launch), it will be insufficient. Okay, a web browser and a file browser, maybe Skype and a media player too, but when you are like me and you use about six web browsers in specialised ways, will you put all of them there? Hardly. I am okay to have a launch menu that populates itself according to most often or most recently used apps - even Rofi can do it -, but I do not want to limit the number of those apps. A search field to search all the apps - and display selectable matches on the fly - is the quickest launcher for me. In XP you can pin some things but the search was introduced in Vista. Ah, you're right. XP had this all-too-encompassing search. Well, indeed I remember having put Opera on Quick Launch back on XP days A little Quick Launch section is not a bad thing. But the thing is that it is little. I cannot let the Quick Launch be all over the taskbar like Win 10 insists at first. I make space for window titles there. Yesterday I acquired a device that has Android 8.1 on it. When you have icons on the home screen and you long press them, some yield a menu of options like "open home page" and "open incognito" or whatever else the app does. However, most only provide "app info" i.e. nothing useful. And nothing that can be changed. Seriously, those list-y things are only useful when configurable.